Meet Clive - and his imagination! 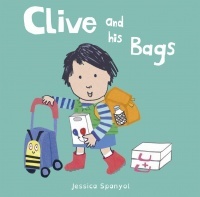 Clive loves his collection of bags, and each one suggests a different adventure. He enjoys playing with them, and sharing them with his friends. A gentle, affectionate book, celebrating diversity and challenging gender stereotypes. Let’s find out which toys Rosa and her friends are playing with today! An important series that celebrates inclusivity, promotes gender equality and embraces the uniqueness of every child.